This is the the second part of my article series on - A guide for Ajanta caves. In the first part, I narrated the brief history of Ajanta and guide for Ajanta cave number 1. 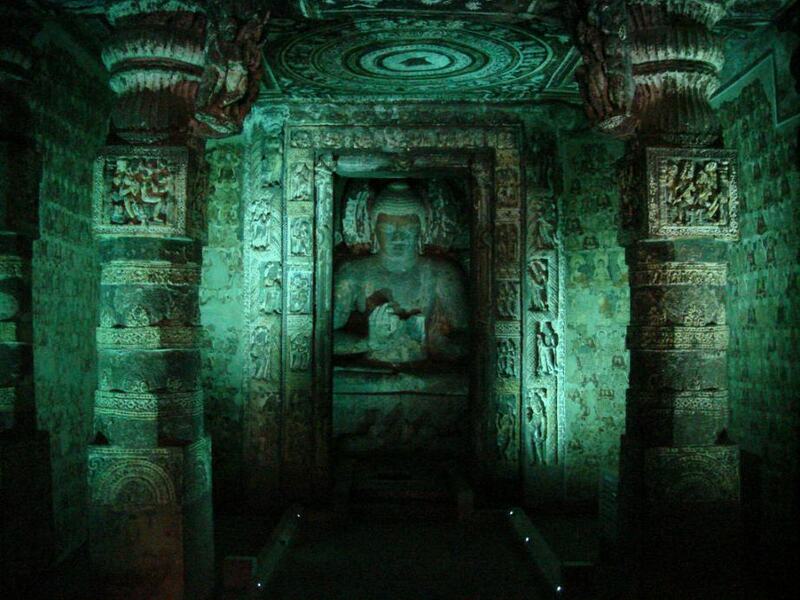 This article is about Ajanta cave number 2. According to Walter M Spink the construction of Ajanta cave number 2 started in AD 464. It was started before the construction of Ajanta cave 1. This claim is supported by the location of cave 2 compared to cave 1. Given that the development of Ajanta caves started from the middle of the horse shoe shaped cliff and then slowly progress towards either sides, cave 2 have got an earlier position than cave 1. All the prime caves of Ajanta are located around the middle of the horse shoe shaped cliff. Even though it is not clearly known, there are many evidences in this cave to believe that the patron of this cave was a lady. Feminine themes are give much importance in this cave. 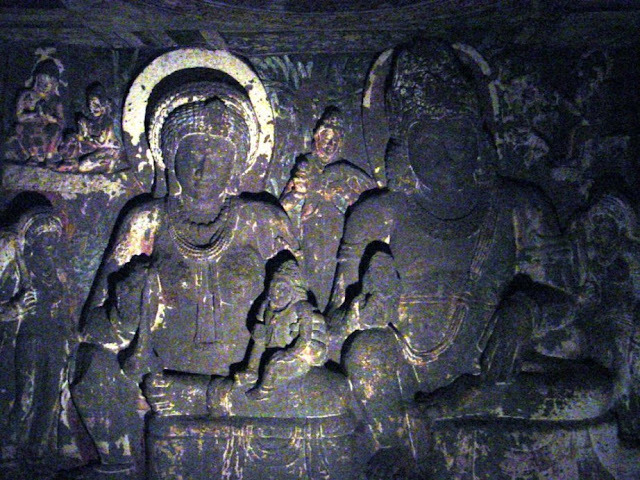 The shrine of Ajanta cave number 2 is beautifully constructed with a seated Buddha flanked by flying dwarf attendants. All the walls of shrine's antechamber is painted with miniature seated Buddha figures - popularly known as a thousand Buddhas of Ajanta cave. However the these paintings are not of high quality. The ceiling medallion design in the antechamber is an example for a high quality Ajanta painting. The central portion seems to be chipped off. Originally there was a hook in the center to hang the flower garlands, however due to constant use it might have been broken. It is an evidence that Ajanta cave number two was used for active worship. One of the main paintings in Ajanta cave number 2 is the story of Vidura Pandita. This story is elaborated in great detail in the Ajanta cave 2 paintings. Sections of walls are dedicated to the story of Vidua Pandita. Vidura was a wise prime minister of a Kuru King. His wisdom was well known not only in his own Kingdom but in surrounding kindgoms as well. Wife of a Naga King desired for the heart of Vidura. Her daughter undertook the challenging task of bringing Vidura to the palace of Naga King. She married a Yaksha in order to help her in the task. You can read the complete story here. If you take a guide for Ajanta caves, make sure you ask to see this elaborate painting. With the help of guide you can decode this painting. The right side of the main shrine consist of sub-shrine that shows Hariti and Pancika. This sub shine is not easily visible as the entry is restricted. If you ask your guide for Ajanta caves, he might be able to convince the cave guards to get a better look(make sure you dont touch anything!). Hariti was a demon who turned into a protector of children by Buddha's preaching. Hariti (literally means she who robs) used to abduct children from the town of Rajagriha. Buddha played a trick on her to make her realize the pain of losing a child. Buddha hid one of Hariti's 500 children and she repented her deeds and turned into a protector of children. Hariti is accompanied by a male figure seated right next to her. This is the figure of a Yaksha, identified as Hariti's husband. He is named Pancika according some traditions but according to central Indian legends, the consort of Hariti is Kubera. Giving such a prominence to a female character and the story related to children points to the fact that Ajanta cave number 2 had a female patron. On the left side of the main shrine consist of the idols of two Yakshas - Manibhadra and Purnabadra. They are usually worshiped as a pair. This shrine of Yaksha is beautifully decorated with paintings- both decorative and narrative. Ajanta cave number 2 is unique in the design of these sub-shrines. Manibadhra is depicted as holding a bag of money and Purnabhadra holds a mango. The ceiling is beautifully painted as well as the walls. Same as with the Hariti and Pancika idols, entry is restricted towards the front side of this sub-shrine as well. 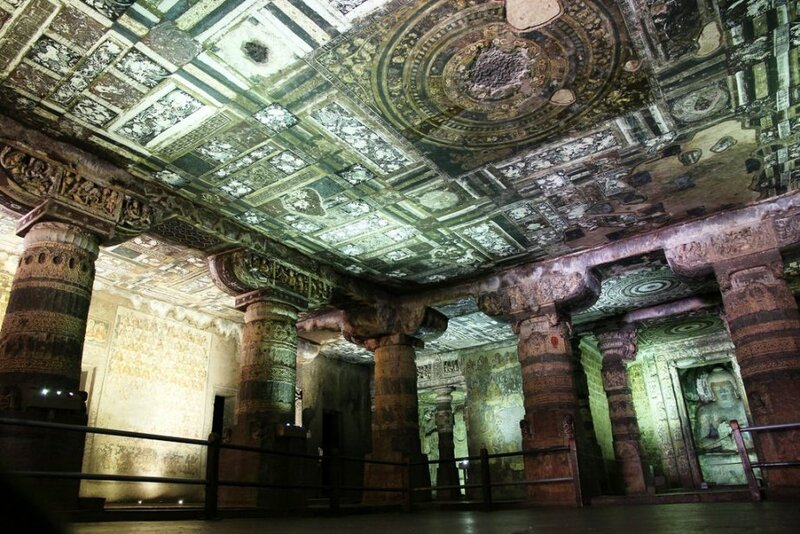 The ceiling paintings of Ajanta cave 2 are noteworthy. While the Ajanta painters saved the Jataka tales for the walls they decorated the ceiling with a variety of designs. They include geometrical shapes, playful dwarfs, varied floral designs painted in bright colors like saffron and lapiz lazuli. Another speciality of the Ajanta cave painters are the ceiling medallions. They can be found throughout Ajanta cave paintings. They are of different designs, colors and complexity.